An event sponsored by public radio station KPCC last week at the University of Redlands explored the topic of “Free Speech vs. Hate Speech” in our communities and on our campuses. 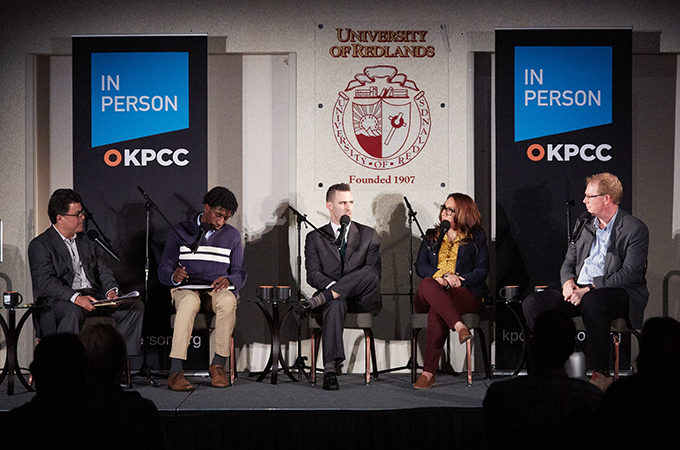 Moderated by KPCC’s In Person host Adolfo Guzman-Lopez, the event tapped the wisdom of both panelists and audience members. Here are some of the perspectives that were expressed. Remarks were edited for brevity and clarity. “All speech is protected by the Constitution unless it has been excluded, and only a few categories have been excluded. Lewd and obscene speech is excluded from protection. A certain kind of profanity is excluded. Defamation is excluded. And “fighting words” are excluded. In general, hate speech is protected speech. You can engage in hate speech, and it's not unlawful. When hate speech starts to cross over into something that incites violence, then it can become unlawful. Three factors need to accompany hate speech to turn it into something unlawful: an imminent danger of unlawful action, an intent by the speaker of inciting that unlawful action, and the likelihood that unlawful action will take place. For example, posting something on Facebook in a general way is different than saying something at a rally, where people's emotions are inflamed. “I hold two beliefs that many find contradictory. On one hand, words themselves are not physical violence. Words can incite violence. And, if it meets the constitutional test, they can be prescribed, although, over the years, the fighting-words doctrine has pretty much been written out of practical law.